The artist Daniel González invites you to bring a lamp from home and to help temporarily transform your personal everyday objects into a wearable artwork. Whether these lamps were bought or given as a present, whether they are new or old, transcending taste and category, they will all be stars during the Bohemian Texas Street Home Fashion Show. 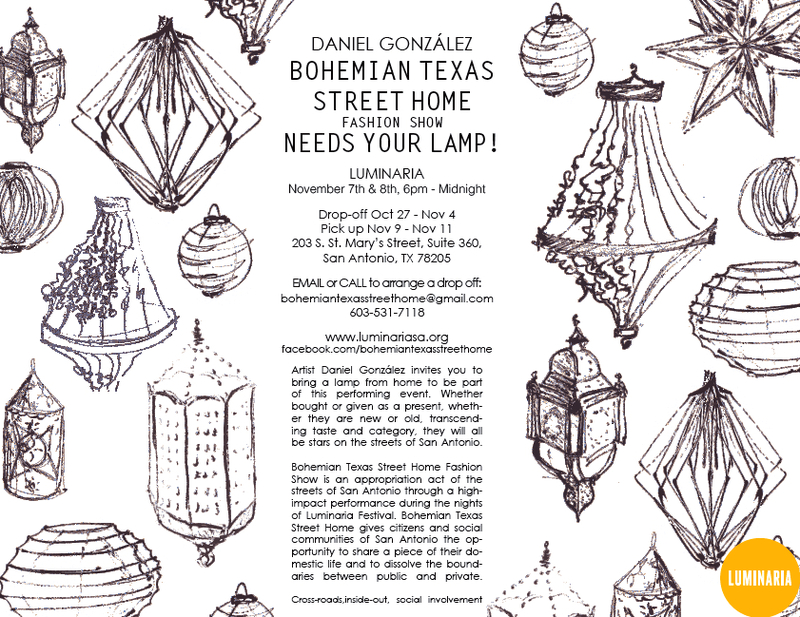 FREE YOUR CREATIVITY Build your own Bohemian Texas Street Home lamp! Gather with your friends, bowling group, chorus member, school mates, family friends, football fellows…. and create your lamp, write a message on it, weird, classical, car-like or piñatas! All of them will be hanging on or carried by the performers during the Bohemian Texas Street Home Fashion Show! After the festival, the artist Daniel González will sign every lamp because it became a testimony of the artistic performance. You will be able to collect your lamp back from November 9th till November 11h at 203 S. St. Mary’s Street, Suite 360, San Antonio, TX 78205. LUMINARIA Festival will take care of photo reporting the event and the art installation during the nights of the Festival, but your personal contribution is definitely crucial!